Marc has renovated the property so that there’s a washing machine, dishwasher and plenty of hot water for the shower. But it’s still highly original with stone and wood stairs and features such as an amazing old stone sink in the kitchen. The garden is private and it was lovely sitting out in the roofed area which protected us from both the sun and rain! Thank you to Alain who provided a warm welcome when we arrived. We loved the area. 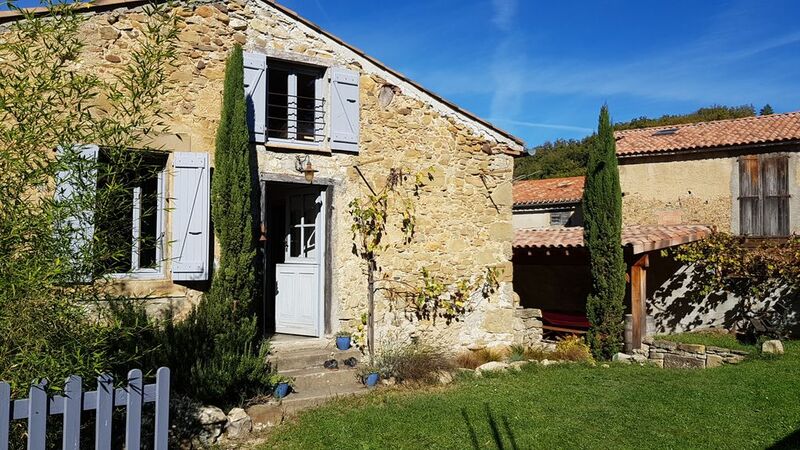 The house is located midway between Limoux for wine tasting and Mirepoix for the fabulous Monday market. We also went to Carcassonne which we thought was a bit too ‘Disney ‘. We much preferred Montsegur and Peyrepertuse A highlight was walking up St Barthelemy. So amazing to be able to stay in this tiny and ancient village in an authentically renovated home. The house was comfortable with everything we needed. Hosts were very friendly & helpful and it was a great base for exploring the beautiful countryside all around. Thank you! Really relaxed four days in the sun! Nous avons été très bien accueillis par Alain. marc le propriétaire est aussi très disponible. La maison est parfaite pour 6. Elle est très bien équipée : wifi, lave linge, lave vaisselle... nous sommes ravis de notre séjour. La maison, récemment rénovée, a du cachet et répond aux besoins d’un séjour reposant dans un village comptant très peu d’habitants. L’environnement est propice à des balades et à la visite des châteaux cathares situés dans un périmètre restreint. Très bon accueil par le propriétaire qui reste à l'écoute.